Some really nice docs for a Norwood LF7 Coupe were sold a few days ago by seller rradar2002 out of Medford, OR. 68 Camaro Owners Manual + Envelope + Waranty & Owner Protection Plan with Metal ID Plate + Window Sticker + Milage Sticker + Inspection Schedule + Air Pollution Brochure. Most items are in VG to Excellent Condition. Was saved from vehicle I owned and kept inside out of sun or moisture. Will make a nice presentation for your Camaro. Be sure to ask about the condition of individual items before bidding. Thanks. They were purchased with a buy it now of $50.00 by another ebay seller wbjpmj out of Canfield, OH, but in HIS ad, the car has magically turned into an SS!! THIS IS THE REAL DEAL. A FACTORY ORIGINAL 1968 CAMARO SPORT COUPE SS WINDOW STICKER WITH THE MATCHING OWNERS PROTECTION PLAN BOOKLET AND THE ORIGINAL NEW VEHICLE CHECK IN SHEET. IF YOU OWN A BUTTERNUT YELLOW SS WITH A BLACK VINYL TOP VIN ID: 124378N449356 SOLD NEW IN AUGUST OF 1968 FROM DANIELS CHEVROLET IN COLORADO SPRINGS COLORADO THIS IS YOUR ORIGINAL DOCUMENTATION !!!!!! This is one of those pieces that you don't find everyday and when you do it is not in the condition this piece is in for that exclusive show piece. No need to play the bidding game here as you can buy it today and receive it in three days. All Literature listed is of the finest quality and will compliment any show car of any quality. Unless listed as a daily driver piece the photo that you see is the item that you will receive. If for any reason you are not happy with your purchase simply send it back and I will refund your purchase price less the original shipping costs. If you are looking for the finishing touch for your show piece or daily driver and want only the best in Factory Original Literature in hard to find pieces you have found on of the Rarest collections in existence. I will be listing 20-25 pieces per week until sold which I can assure you will be quite sometime with over 1,600 pieces for all makes and models. I have the Original owners manuals, warranty booklet's and plates, tire brochures, emission brochures, radio brochures, convertible top manuals, envelopes, bags, leather pouches and anything else that may have been found in the glove box of the vehicle when it rolled off the showroom floor. You will find that my prices based on the condition of all of my literature are the best on E-Bay. I have factory original owners Manuals and Portfolio's for most makes and models from 1929 to 2013. If you do not see what you are looking for add me to your favorites as I am sure it will be available here soon. The item you see is the one being sent to you should you be the winning bidder. There are no RE-PRINTS in this collection. RE-PRINTS are found all over the internet, however factory original pieces are of the hardest to acquire especially in the condition found here. Factory Original Owners Protection Plan Booklet with Metal Plate for a 1968 Camaro Sport Coupe WITH THE MATCHING ORIGINAL WINDOW STICKER AND MATCHING VIN. This particular piece was from a Butternut Yellow with a Black Vinyl Top VIN ID: 124378N449356 with the Matching OPP Manual and Plate. The book is in exceptional condition, Original Part number is 3936265 FIRST Edition and also has the Original Dealer Pre-Delivery Sheet and the owners name was never filled in. As seen in the photo literature is in excellent condition. Rating this piece on a scale of 1-10 considering it's age I would give it a 9.5. Please review the photo closely prior to bid or purchase. Being an original piece which is very hard to acquire it is an excellent original piece. Looking for other Vette Manuals, Import Manuals, Domestic Manuals, Service Manuals, Parts Manuals, or other unique show car literature keep checking my auctions as they will be here. All items will be sent by Economy First Class Mail with delivery confirmation for your protection as well as mine. Shipping will be FREE across the United States and $8.00 to Canada. Others please e-mail prior to purchase and verify that I ship to your area. Not only that, but he didn't include the rest of the docs and paperwork in his auction, so you're getting less for more $$$! Now, I'm not saying the new seller is trying to rip anyone off (you can make that decision on your own), but I've contacted him about his "mistake", and what do you wnat to bet the auction WON'T be changed? I've seen several eBay items worded incorrectly and it's obvious on purpose to fool the buyer. Examples are NOS booster hoses (NOS hoses that were stamped later) w/stampings worded cleverly as if it was a true left-the-factory with stamping. The ad may be an honest mistake or someone trying to take advantage of others who doesn't know better. It will be interesting to see how this plays out after you notified them. And he has a 100% rate on Ebay... which has nothing to do with what he is selling, now does it?!? Anyone with half a brain would realize there is no call out on the Window Sticker for any SS package at all. a pro street tubbed and customized. You got it !! I'll let you know what I get back. Amazing that I got no response. I guess he was busy trying to beat somebody else out of money. No reply for me either. The only thing that's changed in the auction is that he's lowered the Buy it Now price from $179.99 to $144.99! The only thing that's changed in the auction is that he's lowered the Buy it Now price from $179.99 to $144.99! He also removed "SS" from the title; although it still appears in the item description. The title now says "1968 Camaro SC Factory GM Original Owner Protection Plan W Matching Sticker RARE"
Yes indeed, there are a lot of questionable items on e bay. My favorite are the parts listed as "original part, slightly used" .............on a car that is a 1969? How slightly used could it have been on a 44 year old car? Typically the price is a huge amount for those kinds of items. In the years I have been watching this site ,and now being active, one would think between here and Team Camaro ,most of these cars are accounted for. Which would include parts/paperwork. More to the point: if you are legit and selling ,you had better be pecking away on CRG if you are demanding top dollar. Word of mouth can still rule here. No better watch dog group I know of for these cars. Another way to look at it, if my date coded CHP blueprinted 68 Z distributor disappears out of my shop ,and ends up on eBay for 1500+ this site should blow up with comments--goes for everybody's parts here. And if we're not buying ,who are? Another way to look at it, if my date coded CHP blueprinted 68 Z distributor disappears out of my shop ,and ends up on eBay for 1500+ this site should blow up with comments--goes for everybody's parts here. With a mirror image, it looks like "Verl G Whips" out of Grant Nebraska. 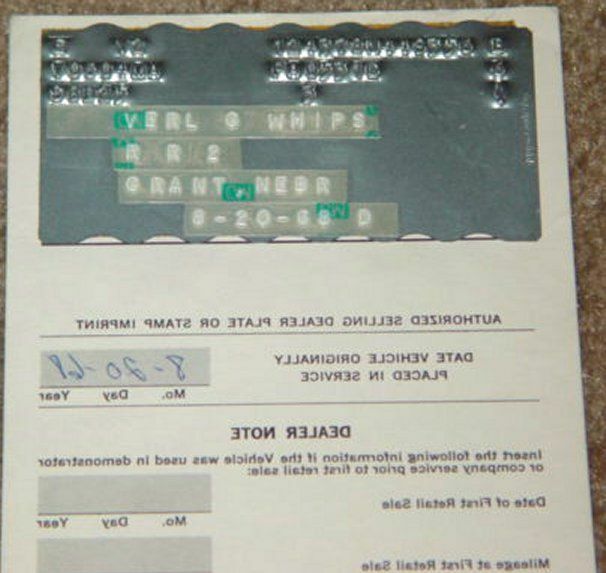 With a quick Google search, it looks like there is a "Verl G Whips" who is 67 years old and lives in West Sacramento, CA. This listing was ended on 10-5-13 by the seller because the item is no longer available.